Amethyst cluster frae Magaliesburg, Sooth Africae. 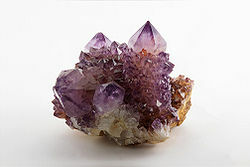 Amethyst is a violet variety o quartz eften uised in jewelry. The name comes frae the Auncient Greek ἀ a- ("nae") an μέθυστος methustos ("intoxicatit"), a reference tae the belief that the stane pertectit its ainer frae drunkenness. The auncient Greeks an Romans wore amethyst an made drinkin vessels o it in the belief that it wad prevent intoxication. It is ane o several furms o quartz. Amethyst is a semiprecious stane an is the tradeetional birthstane for Februar. This page wis last eeditit on 16 Mey 2018, at 05:26.